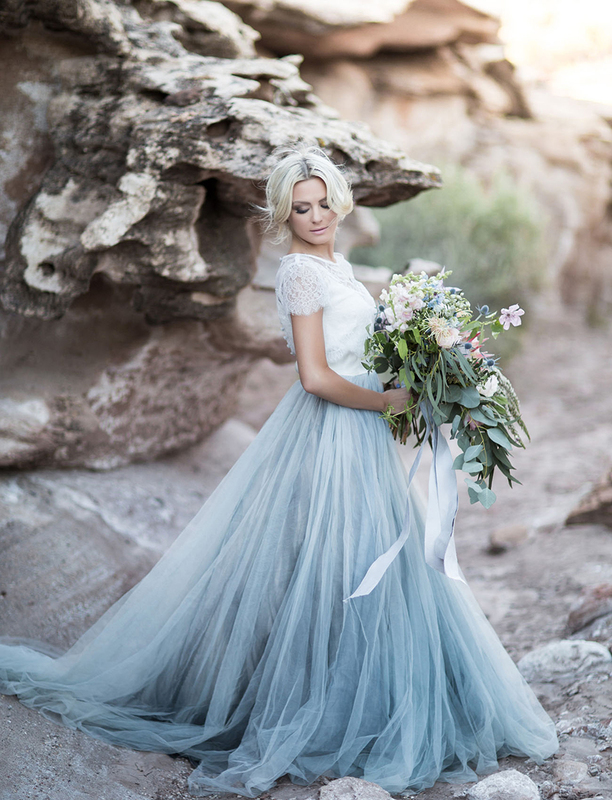 Dare to be different with a beautiful blue wedding dress! 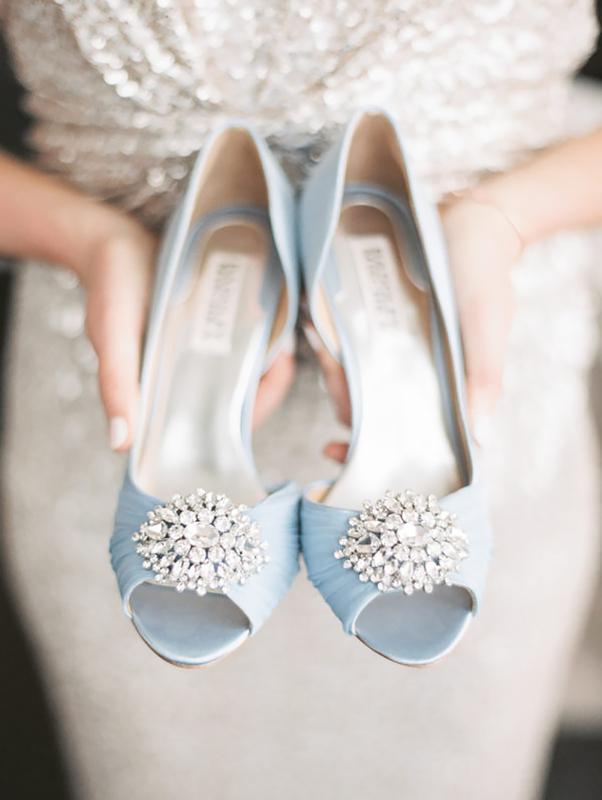 If you’re looking to introduce colour to your wedding dress, blue is a great choice. It’s wonderfully versatile, from the softest powder blue to shades of deep midnight, and it’s a colour that your bridesmaids and your groom will probably enjoy wearing too. We look at some of our favourite blue wedding dresses, whether you choose to wear an entirely blue gown or just to add a hint of colour. Pretty as can be and with just a hint of blue, don’t miss the ‘Lucille’ dress from Temperley London. This shade of blue is flattering and wonderfully elegant for a woodland themed wedding. If you like the idea of wearing blue but you’d prefer to have white around the neckline, stay on trend with an ombre gown. 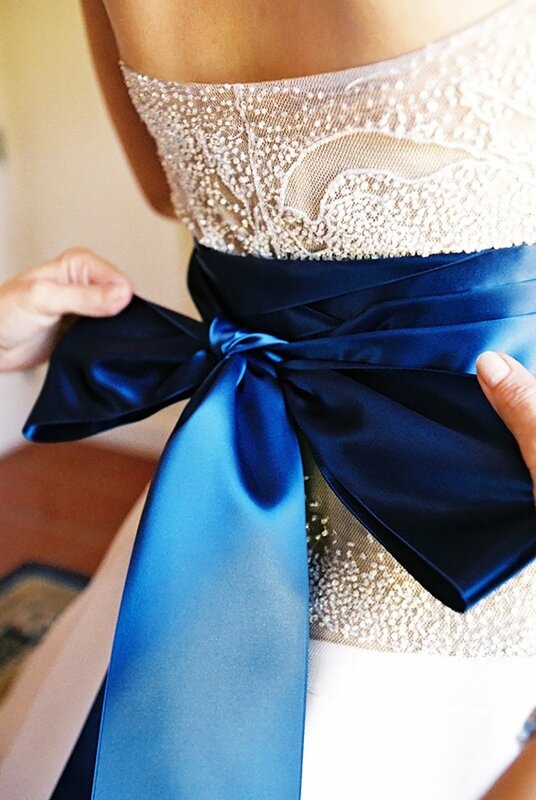 Wear a white or ivory gown but add your ‘something blue’ with a lovely sash at the waist. Navy works well if your fiancé likes the idea of wearing a navy suit. 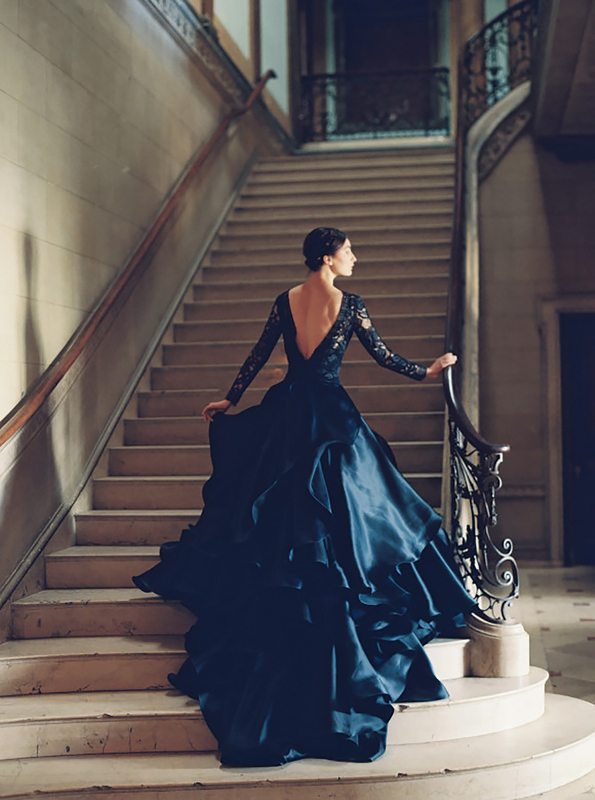 Midnight blue is breathtaking for an evening wedding. With a design like this, your venue needs to be equally imposing! We can imagine this gown in Davenport House in Shropshire or Morden Hall in London. 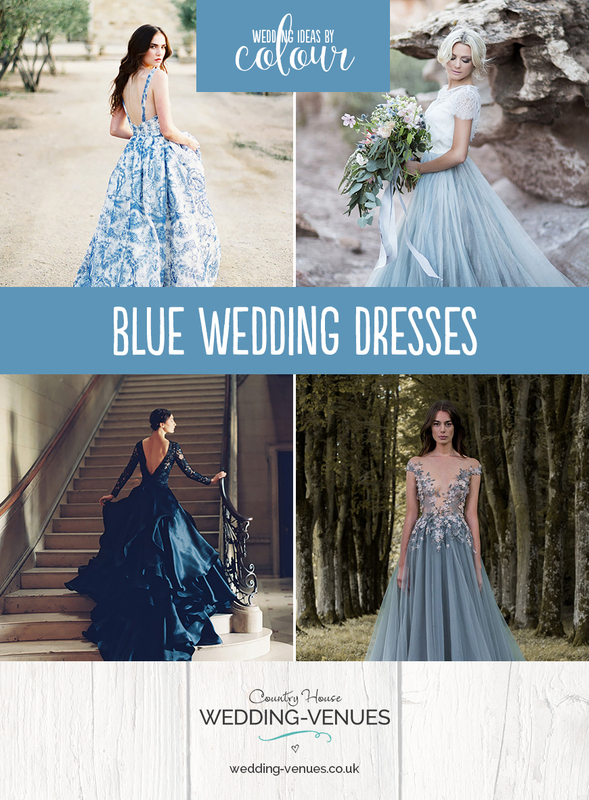 If you’re looking for an entirely blue wedding dress, you’re likely to find some great evening dress designs on the high street. The ‘Olivia’ high neck chiffon dress from Debenhams is a favourite. With a stunning back and in a dreamy shade of blue, the ‘Millie Dillmount’ gown is from the evening dress collection by Eliza Jane Howell. We love a stripe. Don’t miss ‘Libertine’ with its full A-line skirt by Ian Stuart. A floral overlay is delicate and pretty. 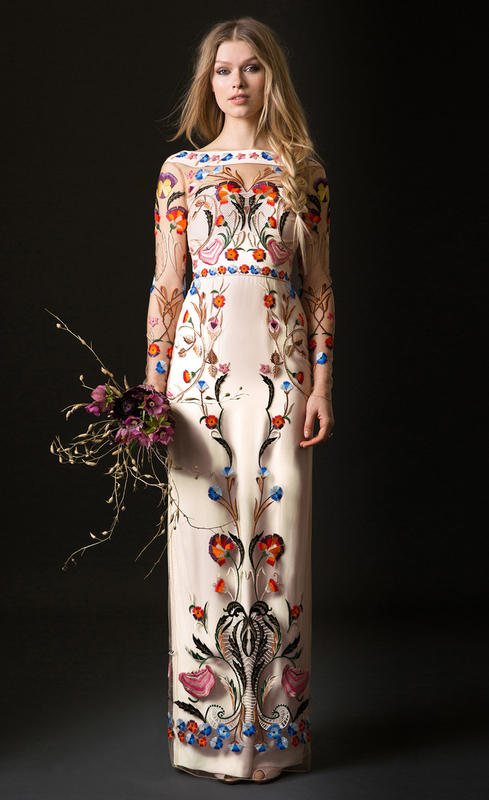 Choose something a little different with this fabulous embroidered ‘Toledo’ dress from the new bridal collection at Temperley London – the perfect complement to your blue wedding ideas. 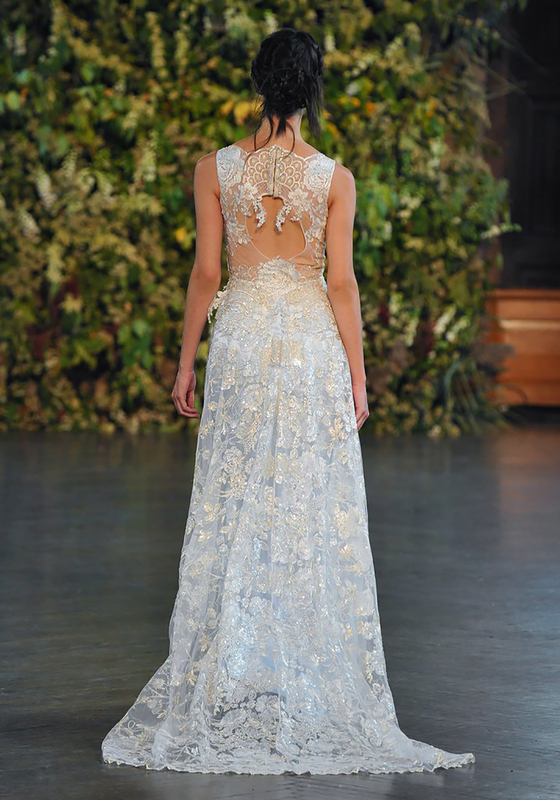 ‘Eden’ by Claire Pettibone boasts a blue silk underlayer. The open keyhole back is stunning. Continue the blue theme with some blue shoes! 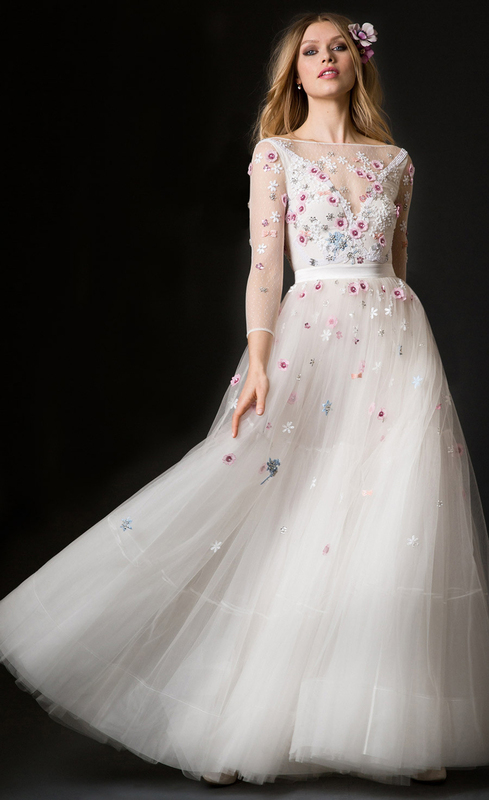 If you’d like to add a colour to your wedding dress but you’re not sure blue is for you, take a look at these stunning blush wedding dresses.